Vintage Mid-Century Modern Helyn Mann "BASEBALL" Original Painting on Canvas. Fantastic original painting on canvas signed by artist Helyn Mann. This is an original piece and the wood frame is included with purchase. We're pretty sure this piece dates to the the 60s era. 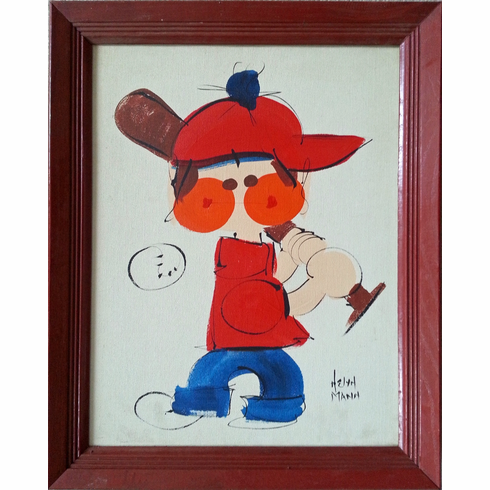 Helyn Mann is known for her circular cheeks and this may be her only baseball theme piece of art. Painting is in excellent condition. Some parts of canvas look a little bit discolored but is not too noticeable. Frame is in nice condition as well. Canvas within the frame measures appx. 13.75" x 17.75" and the frame measures appx. 16.75" x 20.75".